trying to take their camera with them to family events, or for people that love taking pictures of the surroundings. The T200 is a step down in pricing from the T300, coming in at $179 – a price which will not burn a hole in your wallet. The T200’s features include motion panorama, facial recognition, and Photobook assist, which is identical to the T300’s features. In this FinePix T200 review, we take a look at whether or not this is the best on the market for an ultra compact camera. The FinePix T200, out of the box, comes packing a punch with all the features that are available with this camera. Photobook is the newest feature that is included. This helps users keep all of their pictures organized by creating albums on their camera. When a user takes pictures, they will be prompted as to which album they would like to add the picture to. When a group of pictures is taken, they will no longer be added to the never ending list of pictures available on the camera. Now users will be able to choose an album and find all of the pictures that they intended searching for. A feature that has been seen in most Fuji compact cameras lately is the Panorama feature. This enables users to take a large picture of a backdrop – something which cannot be done with any traditional camera. After entering the Panorama mode, the T200 will show a progress bar telling the user when the picture is complete. The user will have to pan the camera across a large backdrop, and the camera will determine when it has taken enough pictures to compile a panorama. The end result will be an elongated horizontal picture of the desired backdrop. Having a Facial Recognition feature is an awesome feature that allows users to identify who they are taking a picture of. There is Smile Recognition software included that will not take a picture unless it detects a smile. This will ensure that every picture taken by this camera is a happy one. 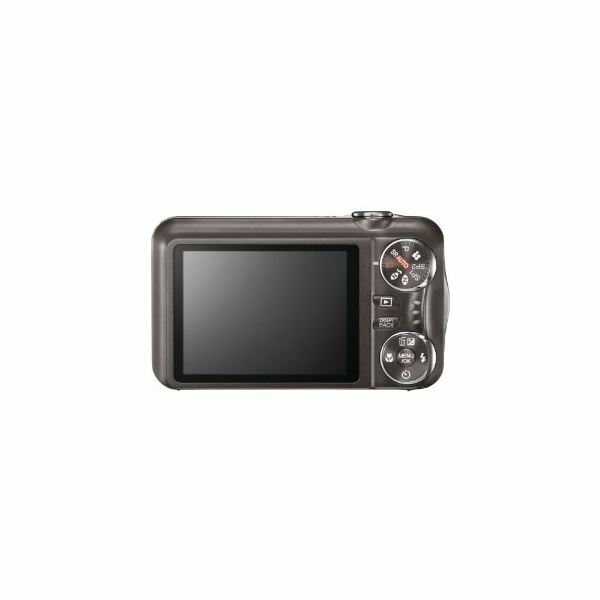 The Fujifilm FinePix T200 can recognize up to eight faces, and will include a name and birthday with each person added. Each time that a face is detected, their name will appear in the picture as a tag. This makes it easy when it comes to finding pictures of a certain person in the user’s camera. Tracking Auto-Focus is an impressive feature that also comes included with this camera. When the user is taking a picture of a moving object, the camera will detect this object and focus in on it even while it is moving. Each time, the object will appear directly in the center of the screen in crystal clear image quality – with no blur. Everything around the object will be blurred most of the time, but the chosen object will never be distorted. Each of Fuji’s ultra-compact cameras, like the T200 and T300, has just about the same exact design. 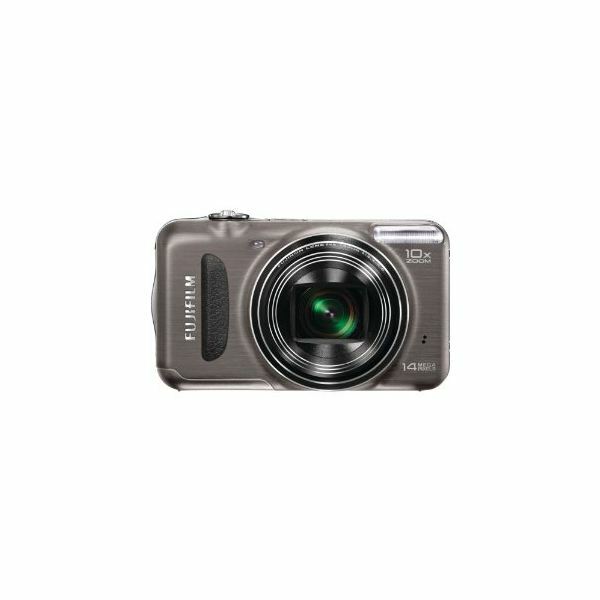 The T200 comes equipped with a 14-megapixel CCD sensor, and takes 720p high-definition pictures. The camera is able to take HD quality video, as well. Videos are shot at 30 frames per second, which makes each video appear quite smooth and pleasant on the eyes. The T200 weighs in at 4.9 ounces, which makes the camera a comfortable fit when carrying it around for extended periods of time. The LCD display of the T200 is 2.7 inches, and is only .3 inches smaller than the T300 model. Every compact camera from Fuji has identical displays and menus. The menus on the camera can be easily navigated and are very user friendly for first-timers. For those hesitant to mess with a menu, there are still physical buttons located on the back panel of the camera. Two circular buttons can change picture settings as well as camera modes. There are also Volume, Play, and Zoom buttons located in the same spot, while the power button to the camera is located directly on the top. For an ultra-compact camera, the T200 packs a punch when it comes to picture quality. Each image has vibrant and lifelike colors when displaying the final image. There is no sign of fade or blur when taking well-lit pictures. The only time that users may find that they have taken a blurry image is when a picture is taken in a dimly-lit area. Taking pictures outside at night will typically result in a blurred image. However, if a picture is taken in a well-lit area, the result will most often be a perfect picture. HD video quality is easy on the eyes even when viewing it on the 2.7-inch LCD display. The video has a ration of 720p, which is impressive for how small the camera is. For users to get the most of their HD video, they should watch the video through their HDTV by using the plug that comes included with the T200. Watching videos and viewing pictures on the LCD display can sometimes become annoying because of the tiny amount of space, but this also occurs with the T300. The FinePix T200 is exactly the same at the T300, but with a .3-inch smaller display. There are so many great features that should be included in other cameras, but are not. I would honestly have to say that you will not make a mistake in choosing either the T200 or T300. Each of these ultra-compact cameras come stock with excellent features, and even better picture and video quality. The price tag is a step down from the T300, coming in at $179. Personally, if I had to choose between the T200 and T300, I would choose the T300 because it is only an extra $20 for a larger screen. This FujiFilm FinePix T200 review is based on the author's experience using the T200 and T300 at a camera expo. The author also acquired the user manual online.